If you are a designer, you can't miss out on this deal! 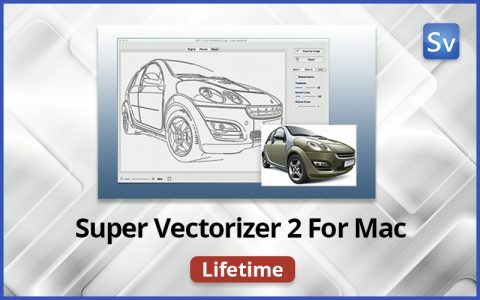 Super Vectorizer 2 for Mac - your best choice to vectorize images. It is a professional vector tracing one-click software that converts bitmap images like JPEG, GIF, etc. to clean, scalable vector graphics. Super Vectorizer 2 uses a totally-new image quantization algorithm that produces more natural color after vectorization. The output vector artworks seamlessly with Illustrator, Corel, and others. Support for up to 64 colors. Segmentation editing capabilities: Trace more clean line borders that greatly simplifies the information to get more concise vector graphic for the ease of editing. It successfully avoids a region overlapping. Vectorization of images by the edge, color, gray color, skeletonization, or line. Two color modes. A new color mode with image segmentation polymerization algorithm was unique in the AppStore at present. Better optimization of line-tracing with a new line-tracing engine: accord more closely with users’ needs. Skeletonization that enables conversion from pencil drawing into a vector graphic. Enhanced pre-processing smoothing function that lets you simplify the complex image as well. Vector graphics output in Ai, SVG, DXF, and PDF formats. Zoom in and zoom out options that let you check the processing results. A Quick Look At These Features In Action! Delivered as an instant download with license key after the order is placed. Designed exclusively to vectorize images on Mac easily. At A DealPrice Of $14.99 Only! does it come in windows format? No, its available for Mac only. Excellent little app that provides very intelligent vectorizations of virtually anything. Makes additional editing in Illustrator very easy and responsive. As it’s name suggests, it’s SUPER! I wanna for Windows too please! Fast, easy and a good alternative to Illustrator for vectorize.